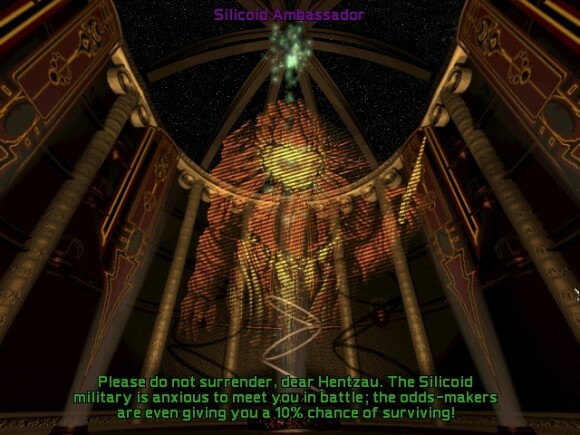 In Praise Of: Master Of Orion 2. Note before we start: “4X” is an acronym invented by a moron for the same reason that the term “FPS” was inserted into the general gaming lexicon: because calling games “Doom clones” and “Civ-alikes” is seen as demeaning to the ones that might actually be trying to iterate and develop a genre. Genre labels are necessary; the term 4X, however, is spectacularly awful, standing as it does for eXplore, eXpand, eXploit and eXterminate. I sometimes wonder if the bored gaming journalist/PR bod who came up with it ever regrets this most enduring of their contributions to gaming culture. Whatever. We’re stuck with it now. If you cast your eye back over the last decade or so of strategy titles, you might notice that the 4X genre is littered with the corpses of dead and dying space-based empire building games. Some of them have been badly made buggy messes (Sword of the Stars 2, for example). Some of them have had a limited amount of impact but are ultimately fading away into obscurity (Galactic Civilizations, Sins of a Solar Empire). Even though the last year has seen an extraordinary number of these titles released – I can probably count at least five off the top of my head – only one of them has had any staying power to my mind, and Endless Space is a game with many of its own problems. Perhaps this isn’t that unusual. I’d expect sci-fi to be a popular setting for games because it requires even less thought than fantasy; you can basically do a hundred iterations of “Modern day thing X, but in the FUTURE” and then call it a day. But why the 4X genre in particular? Compared to sci-fi settings you can count the number of fantasy 4X games on one hand, and I think even historical real-world settings (which are largely propped up by Paradox’s prolific output) are outnumbered by sci-fi ones. This cornucopia of sci-fi games doesn’t exist in a vacuum, though. They exist for a reason. They’re trying to recapture and/or recreate the spirit and feel of an ancient classic. They’re trying to do Master of Orion 2 all over again.